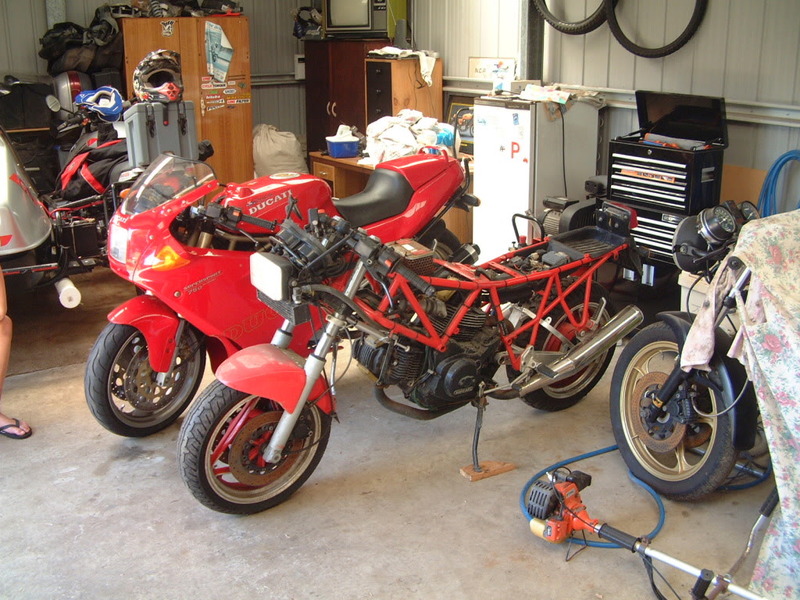 Well I finally convinced a workmate to sell me his much neglected Sport.The poor thing has been sitting in a tin shed at the back of his house for the last ten years.Being a Ducati tragic it was breaking my heart to see it slowly rust away.She's in bad shape but I reckon I can bring her back to life with a little love.I'll clean her up first and see what needs to be done.I've got a feeling the clutch slave cylinder has gone belly up.This will be a long term project and things will get done as funds become available. P.S. more photos to follow when my camera charges up. Last edited by Andrew2 on Mon Aug 18, 2014 11:19 am, edited 1 time in total. wow, that`s one project, I hope you also got the missing parts. 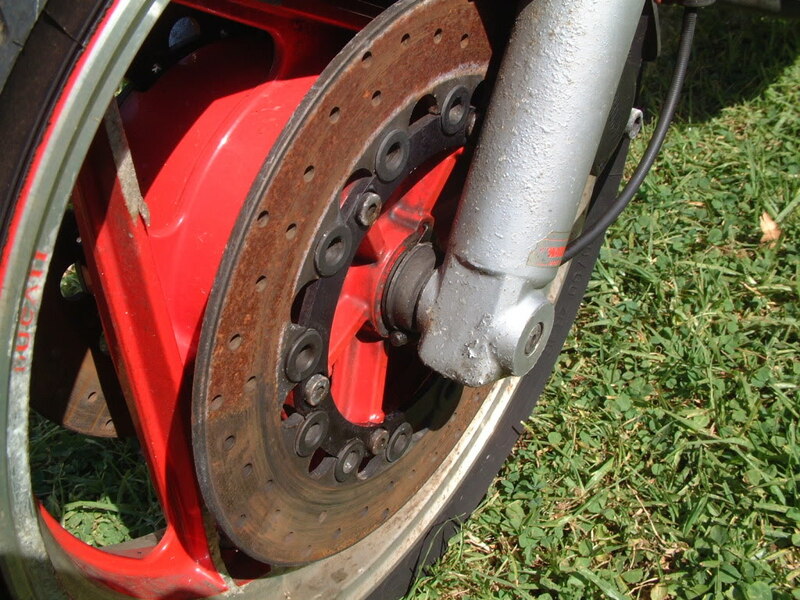 The clutch slave cylinder will be your least worry. It does the same as the fork, just look at the marks. If not used the seal will stick to the metal and when used the seal will tear and it will start leaking and not building up pressure. A complete strip down and rebuild is a nice job. Welcome to the site. Looking forward to see the restoration. Start with a good coating of WD-40 just to save what you already have. Makes cleaning everything up easier too. From what I can tell, its an earlier model. - It has the two ignition pickups, not the single pickup. 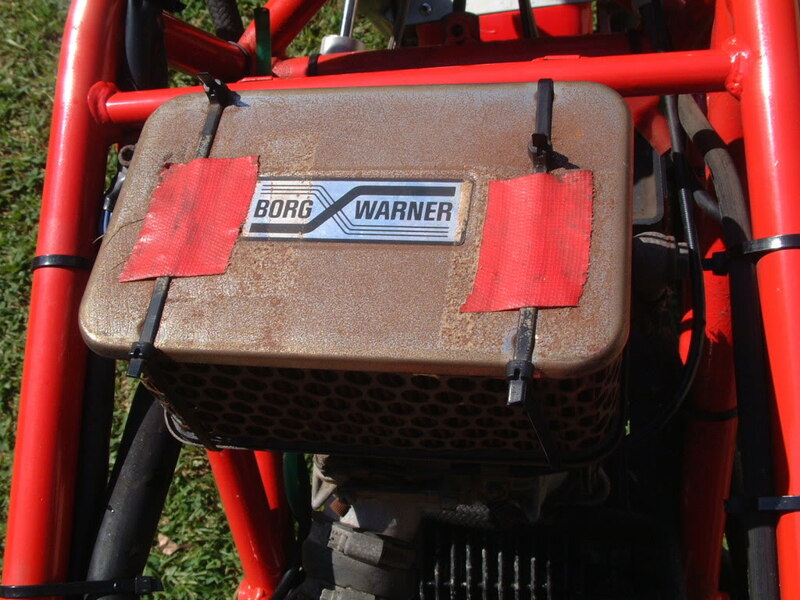 - It does not have the diagonal brace at the steering head. 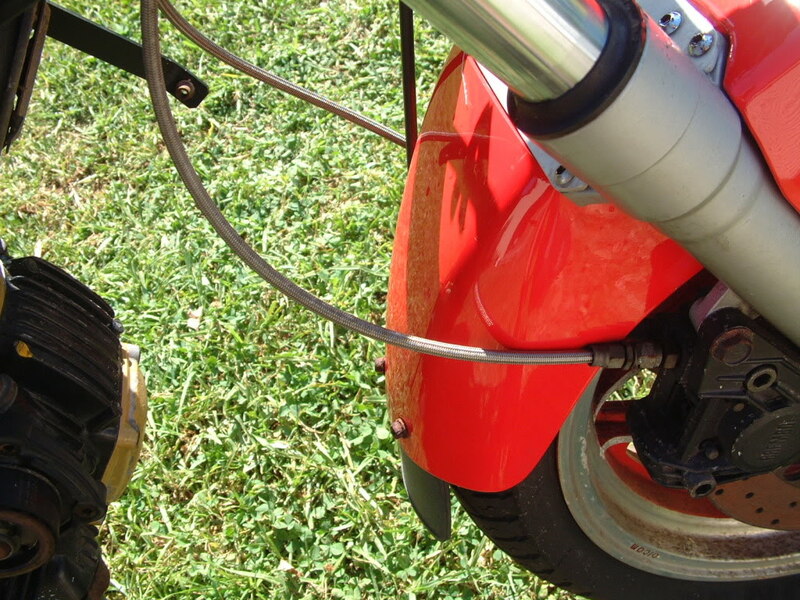 - Rear fender/tray is unmolested. - Its the first time I have seen the two rubber bumpers for the tank. - Nice pipes. Don't know which brand, but they look the part. - Stock Weber with aftermarket air cleaner (I'm betting the foam filter is dead) See the string on the Paso 750 tab for how to make that carb sing. 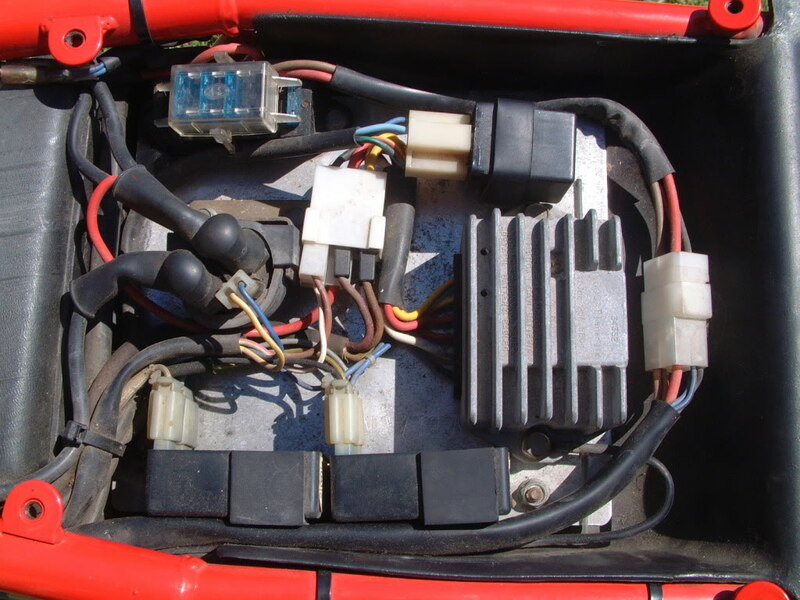 I would start by seeing if you can get the engine to run, then follow with the electrics, chassis, etc. I'm sure you know the usual for an old bike/car. Change all the fluids, replace a few seals. Once you get it running, change the fluids again. Keep us posted and let us know what parts you are looking for. And if you haven't already, read the FAQs and various posts . 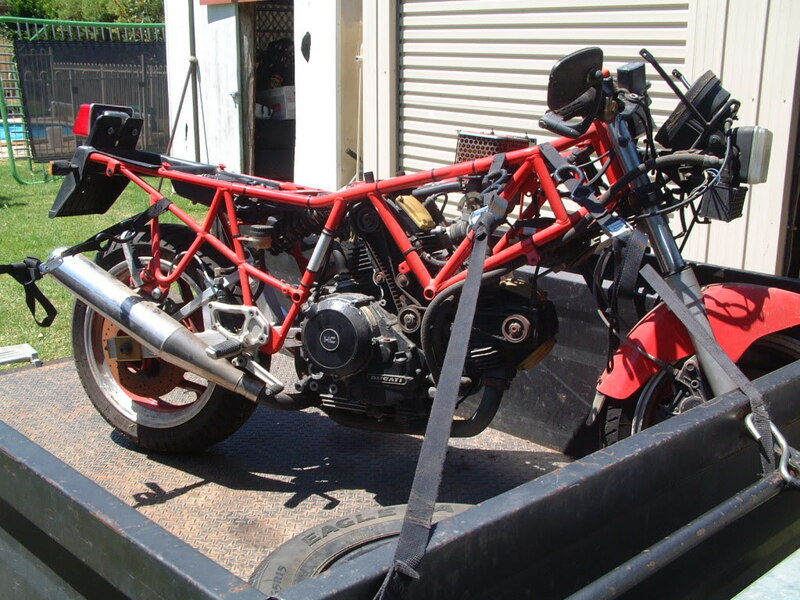 Looks like a project to me, and pretty much what my bike looked like when I bought it. Where are you that its so sunny and summery looking? A bit of work before I`d try that. There must be a reason that bike was put away half disassembled. With the discoloured front fender and the rust all over it may have stood outside, too for a while. 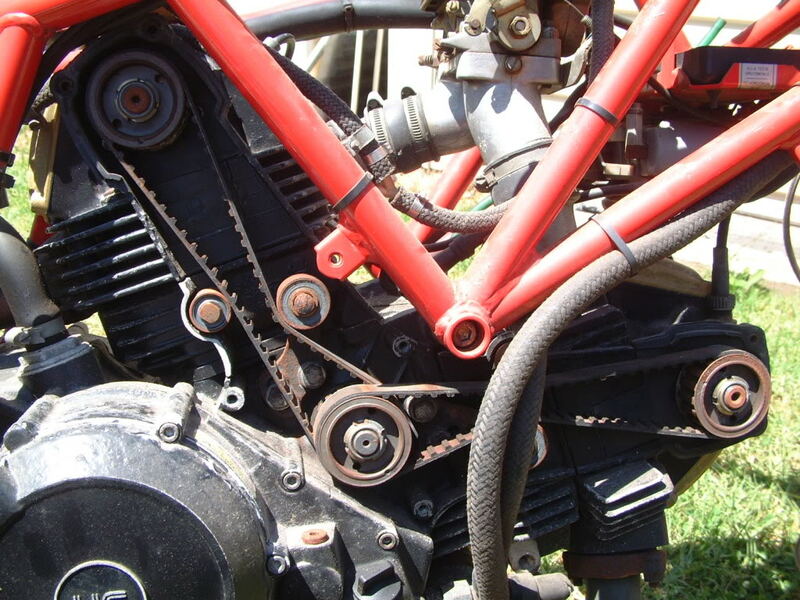 At least with the rusty belt tensioners you don`t really know if they turn properly. Phil, how can you tell ? 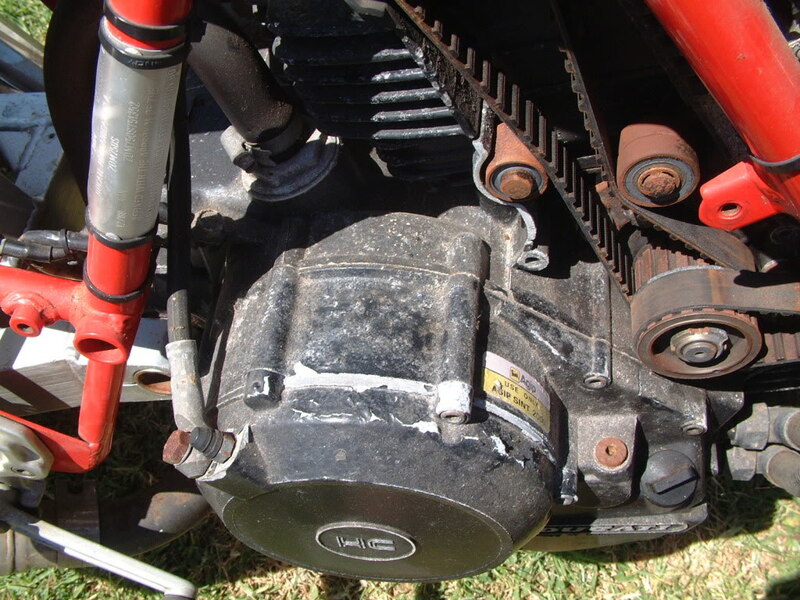 Is that the wiring on the rear of the engine cover/ above the sprocket instead of in the front ? Posting from sunny Australia.All the parts came with the bike including the hugger.The only parts he wants to keep are the original pipes but I'm working on him for those too .He seems to think they'll be worth money one day.The pipes on there now are Staintunes. I'll have a go with the Weber but have a spare set of 40mm Delortos which I had on my Paso.Once jetted corrctly thay worked well so being the same motor I'm hoping they work just as well on the Sport.I know people have said 40's are too big but I had no problems on the 750Paso. 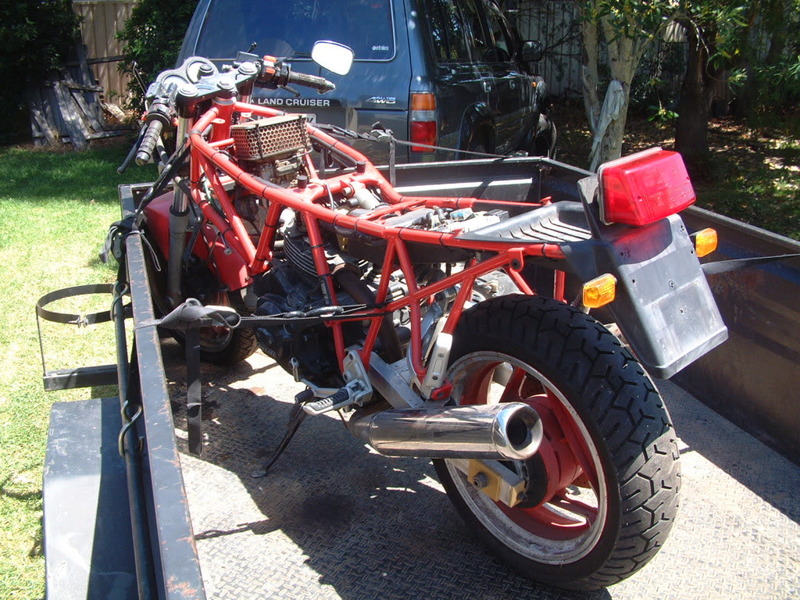 There was a reason Gerhard.The swingarm had cracked again and he stripped the body work off when he removed it to get it rewelded.He then bought a 748 and never put it back together.Unfortunately the 748 took pride of place and the Sport got shunted out to a tin shed.He also lives near the ocean which accounts for the rust and corrosion. Luckily all the cosmetics were kept inside. 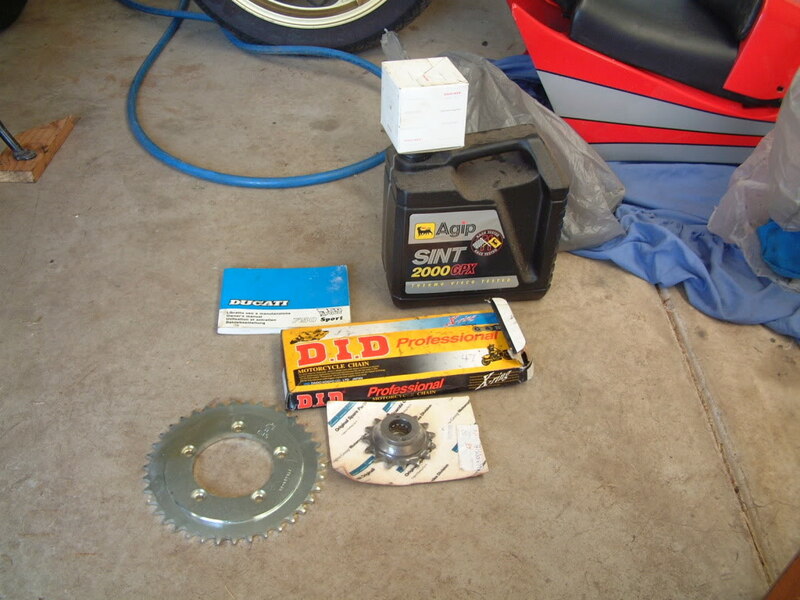 Got new sprockets and chain + oil and filter too. Anyway I'm heading out to give it her first wash in 10 years. 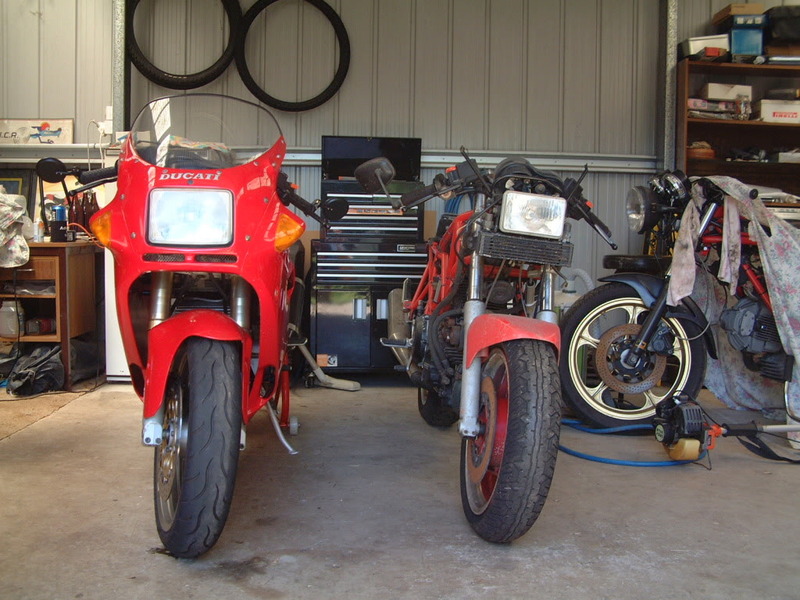 From the looks of your garage, and your collection, your addiction goes deeper than most. Is that a 1978 900 under the covers to the right? With all that you have in your shed, you know quite well what you have bought into. it looks like you have all the parts, now it just needs a bit (a lot) of love. Speaking of love, when your girl gives you the cold shoulder for spending the money, you can spend some quality time in the garage with the other girls. 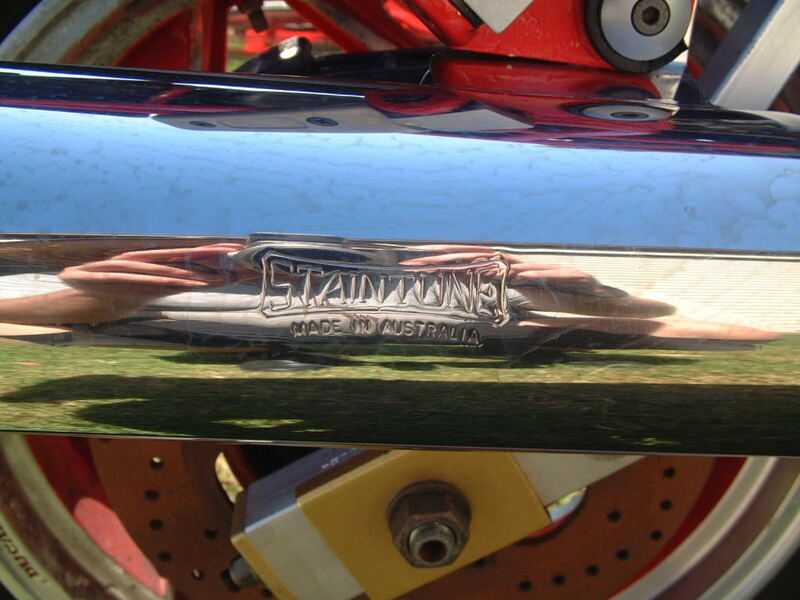 You'll like the Staintunes a lot more than the stock pipes, unless he had some rare race pipes. For the rarity of it all, and the style points, I propose you stick with the Weber. G, you can tell that he has the Kokusan ignition because the block off plate above the alternator. The single pickup goes in that spot. Of course you can tell in the photos he just posted too. It's an '84 MHR.I've had it since new.I've also had in the past a 750 Paso and an '85 750F1. Your right there.I think I'll set up a bed in the garage just in case.The pipes he's keeping are the standard ones.Not sure why he thinks they'll be worth money but I'd rather have the Staintunes. Last edited by Andrew2 on Tue Jan 03, 2012 8:38 am, edited 1 time in total. Ok,she's had a good wash now and I've come to the decision that I'll drop the motor.As you can see the paint is pealing off pretty easily. 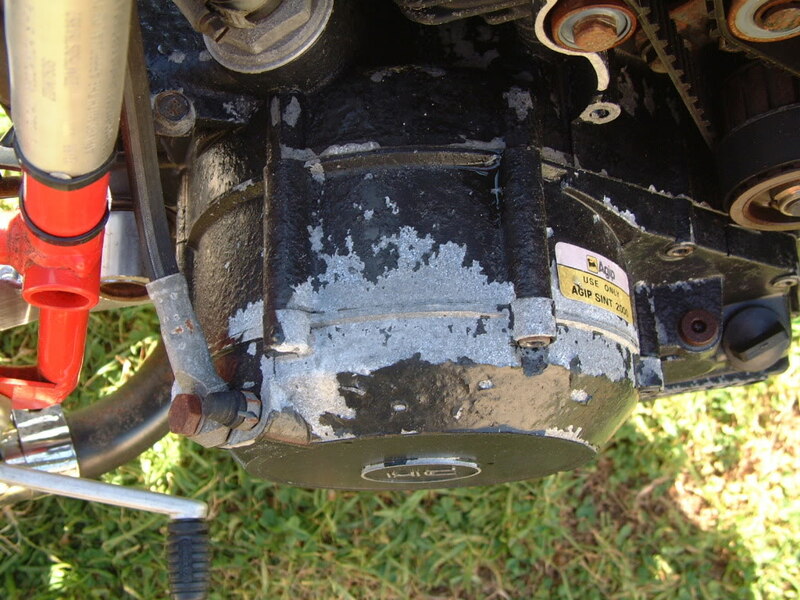 I don't want to pull the motor apart so any suggestion regarding removing the rest of the paint from the motor.Not keen on sand or bead blasting.It's been suggested to use paint stripper but not sure if that will damage gaskets.I've been playing around with soda blasting lately so maybe give that a try?. The mods I've found so far are floating front discs. 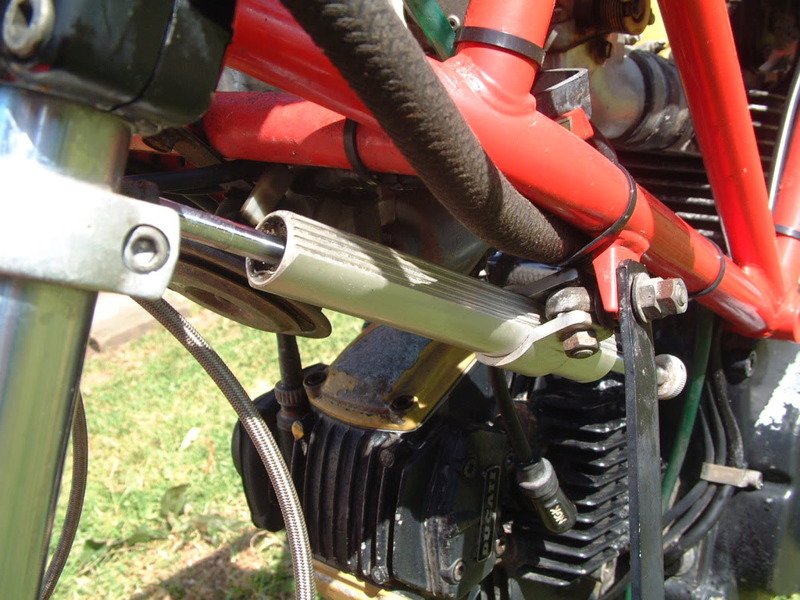 Braided brake lines front and back. Good news.I just turned the motor over with the starter motor and all was good.I'll get her fired up before I start pulling the motor out.I don't want to waste time cleaning up the motor if it's not running . I'll get her fired up before I start pulling the motor out.I don't want to waste time cleaning up the motor if it's not running . You won`t have to either if your 10 year + old belts snap. You may try if you can`t see any cracks in the belts, all rollers turn and you squirted some oil in the plug holes before turning over the engine several times but if it ran 10 years ago when put away it still will. Imho no need to run any risk now just because it`s tempting. Everything inside the engine including cylinder walls and pistons rings will be bone dry after 10 years causing more wear and probably lots of smoke. As the fuel dried I`m sure there`s quite some dirt in the carb, too. I`ve tried soda blasting before. Maybe I don`t have the right equipment but it was only sufficiant to clean the oxidation from aluminium parts. I doubt I could`ve removed any paint with it. If that`s a 2 cylinder compressor near the fridge it`s definetely more powerful than mine. The second fuse in your fuse holder should be a 7.5A. There are not three 15A fuses. I`m a fan of powder coating. The materials used for powder coatings improved a lot in the past years which is why most car manufacturers meanwhile powdercoat rims and brake calipers. Modern powder coating cannot be compared to plastic coating which dries out and peels off after everything below it has rusted away. Actually you can hit the surface with a hammer or try to scratch it with a screw driver and it will withstand. In this points it`s tougher than paint. It`s a lot cheaper too. When I had my frame powder coated I paid about 1/5th of what a painter had asked for simply because he argumented that 80% of the paint is blown in the air when spraying a tube frame. Another advantage is that powder coating usually has an even thickness and also gets better into angles. Ageing resistance meanwhile is also no concern anymore. 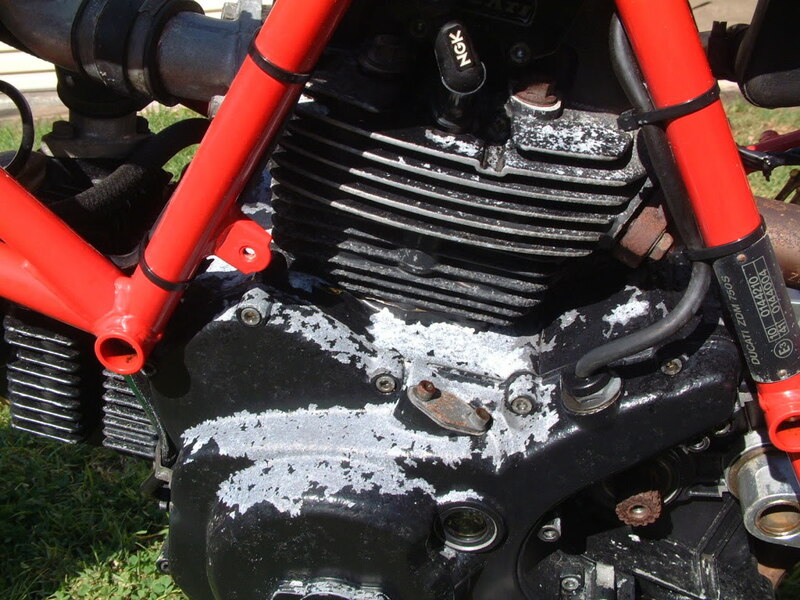 Both paint or powder coat can be damaged and both can lift in the damaged area if humidy enters and the frame starts to rust. Here is the advantage of a paintjob as you can easily fix that. The only way to fix a damaged powder coating is to sand the area and paint it as a powder coating spot repair doesn`t work. The adhesion of powder coating is higher than paint which is a good thing but will become a pia if you ever have to redo that part. The only way is to etch it off. Summed up powder coating is cheaper and more resistant while paint is easier to touch up. 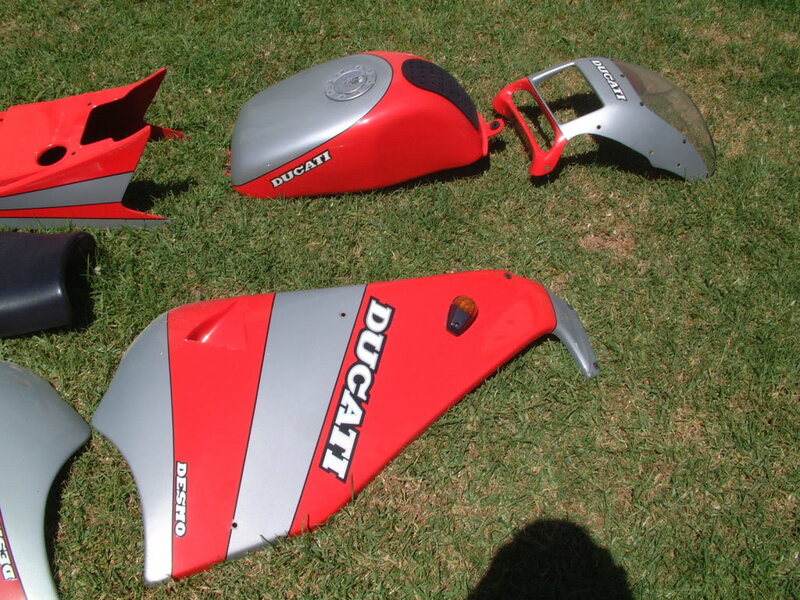 I guess if I had an offroad bike I`d have the frame painted but if it`s one which is covered/protected by fairings I`d stick to powder coating. 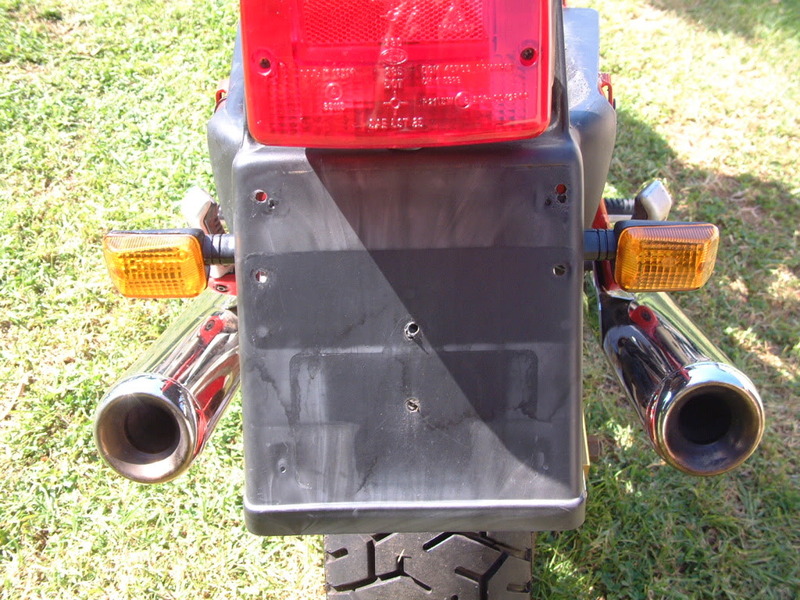 If you go that way you can also have the fairing brackets, headlight frame and the airfilter housing done as parts are media blasted before powder coating. Powder coatings exist in about every RAL colour. I guess we all can help sourcing or have some bits left over from our rebuilds. One more thing. 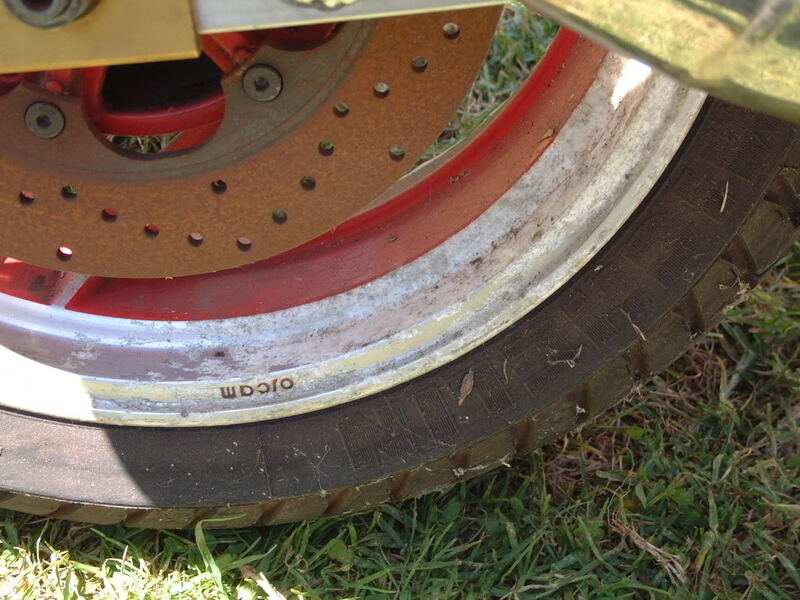 If you don`t know how long your rebuild will take let new belts and tires be the last things you get. 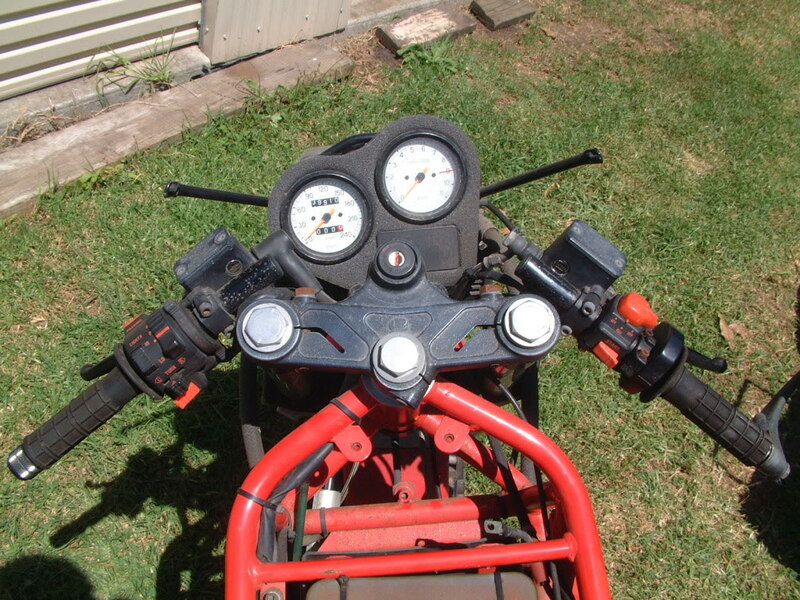 The Thomaselli quick turn throttle is kinda cool, and I like the way he mounted the steering damper. 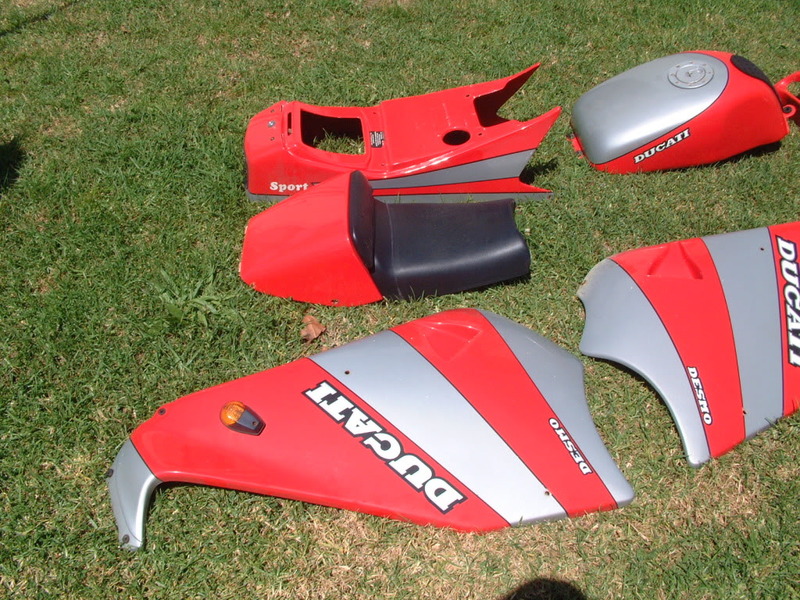 It took me a long time to get mine in a position that didn't hit fairings and frame. I never tried that position, but will now. 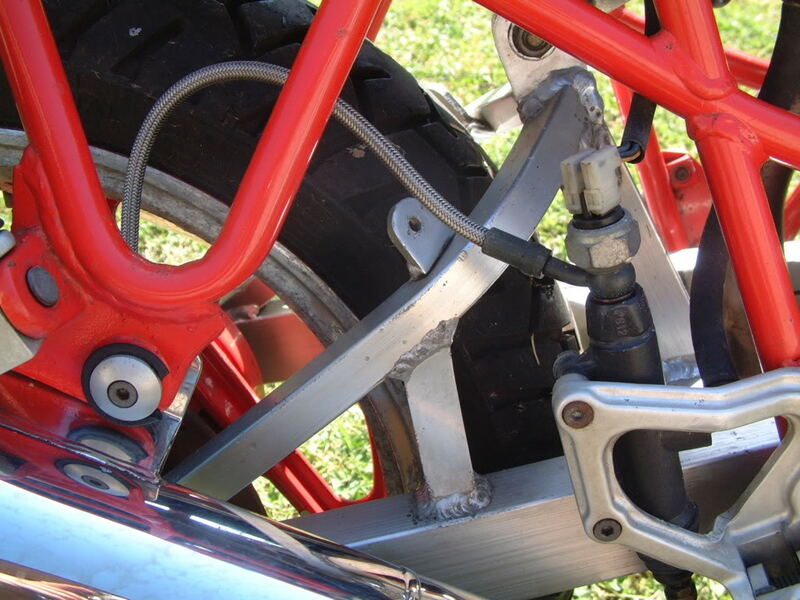 The swingarm brace is stock, as best I remember. I think it was just rewelded. I'm going on memory here, as both of my Sports have modified SS swingarms. And the other upgrades are nice, such as the braided lines and floating rotors, and of course those pipes. 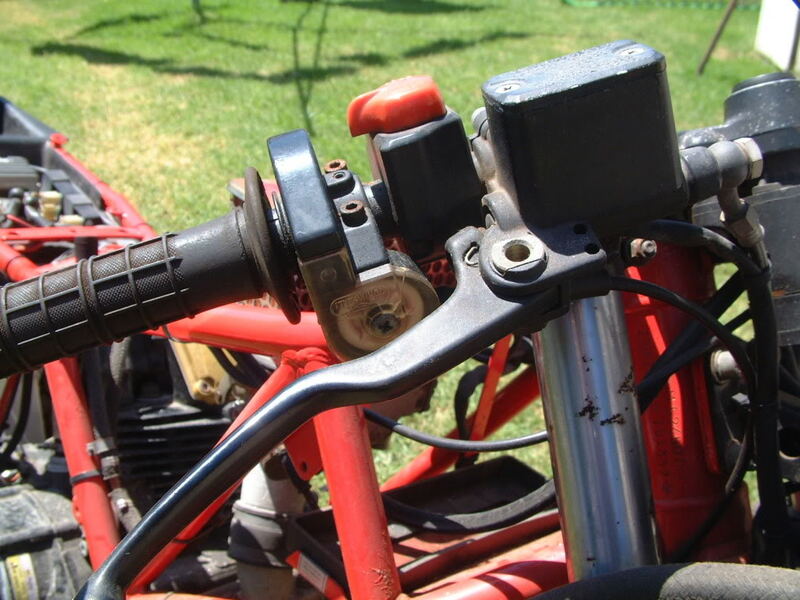 If you are going to paint the frame, consider putting in the diagonal brace that goes to the top of the steering head that was on the later models. 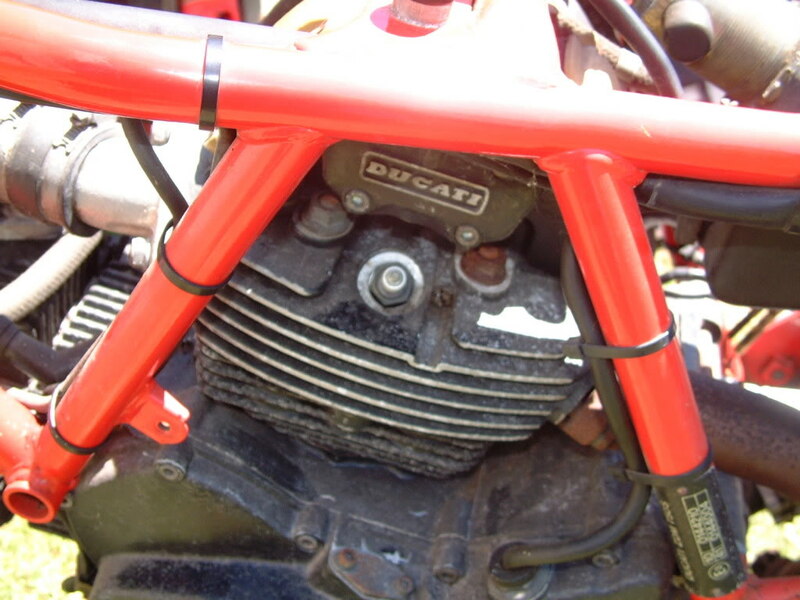 Similar to the brace in the 851 frame. Oh, and those rear turn signals are as rare as hens teeth. I haven't seen a good pair on a Sport before, except in the original tests of the bike. Actually, I think those are the original front signals, as the rear ones had some reallllly long stalks and broke easily. The ones on the front fairings are aftermarket, and seems to be the most common ones put on the Sport. Basically all the bits are there. Now it just comes to freshening everything up. Or, ride it as an ugly Duck for while.